The Professional Outdoor Media Association (POMA) and the American Sportfishing Association’s (ASA) prestigious Homer Circle Fishing Communicator Award was presented to Doug Olander, outdoor writer, conservation advocate and editor-in-chief of Sport Fishing magazine. The POMA/ASA Homer Circle Fishing Communicator Award recognizes a journalist who exemplifies the spirit, dedication to fishing, extraordinary talent, and commitment to mentoring the next generation of sport-fishing communicators as displayed by the legendary outdoor journalist Homer Circle during his storied career. The award was presented July 15, during the International Convention of Allied Sportfishing Trades (ICAST), produced by ASA, the sportfishing industry’s trade association. POMA is the premier professional association representing the traditional outdoor sports media. 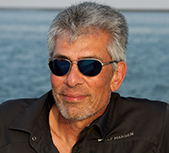 Since 1995, Olander has served as editor-in-chief for Sport Fishing, one of the world’s leading saltwater fishing publications and multi-channel content providers. Under his direction, Sport Fishing magazine increased its circulation dramatically through editorial excellence and its ability to meet the information needs of its readers. “Although many people share Doug’s lifelong passion for fishing and boating, it’s his crusading spirit and a willingness to use his editorial skills to lead the debate on issues facing the recreational fishing and boating community that make him a natural for this honor,” said ASA President and CEO Mike Nussman. Olander was one of the first individuals in the U.S. to recognize and write about the PEW Environment Group’s efforts to establish Australia’s Great Barrier Reef as one vast no-fishing zone. He has also highlighted critical issues involving saltwater fisheries management in the U.S., explaining those issues clearly and succinctly for recreational anglers everywhere. Olander has been honored with numerous other awards of excellence from BoatU.S., several international, regional and state writers’ organizations and the Florida Magazine Association. His writing has been featured in USA Today. Doug has served as a representative for the International Game Fish Association since 1985, and has held a number of all-tackle and line-class world records.